Sirius is quite visible to most of the northern hemisphere. But most of the best stuff is in the southern sky. But Canopus, the second brightest star, isn't. I live at 60° north, so Galaxy center is below the horizon. Taking into account that the best time to observe the Milky Way here is in August and September, and the nights are still quite light, and has huge light pollution, I almost never see the Galaxy center from my city. But I do see this at Kavkaz, when I go to the SAO observatory. There is a huge number of nebulae that can be seen with the naked eye. The Milky Way is the most beautiful sight when seen in Earth's sky. BTW, which of you guys have ever seen an aurora? I was born and lived my childhood in Murmansk, a north city at 69°, and my best childhood astronomical recall is a bright beautiful aurora, that can be seen often there. I am at 32N, I wish to see the LMC and SMC so bad! I wonder how bright there are! Does anyone know? I haven't seen a nice photo of them without exposure. I'd imagine they are brighter than the Milky Way core though, right? There's no such thing as a photo without exposure. A photo IS an exposure. Based on images I've seen, they are probably about as bright as an average section of the Milky Way. The Large and Small Magellanic Clouds may have collided around 300 million years ago, as evidenced by an apparent stream of stars that LMC stole from SMC. I went to Yosemite and that was the first time I could see the galactic center. HarbingerDawn, cool that means that the first ancestors of the dinosaurs would have seen them collide or something? Not galaxy-related per se, but it's close enough. A study of the rates of star formation across the history of the universe shows that the rate of star formation has been declining for the past 11 billion years or so and is currently just 3% of its ancient peak. Furthermore, if the present rate of decline continues, then that means that over 95% of all stars that will ever exist have already been born. 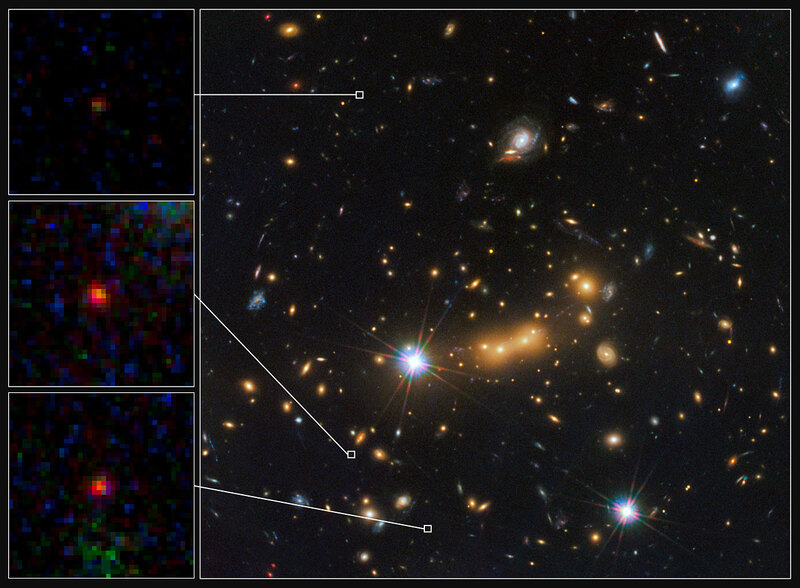 A new galaxy discovered by Hubble is the most distant yet seen at 13.3 billion years ago, just 420 million years after the Big Bang. Its light was lensed by a galaxy cluster into multiple images. The Milky Way galaxy may be less massive than previously thought, based on observations of stars in the outer halo (250 000 - 500 000 light years from the galactic center). Those observations suggest that the Milky Way is between 500 billion and 1 trillion Solar masses. However, stars in that region of the halo have poorly characterized orbits and it is still possible that the Milky Way may be more massive than this study suggests, as was previously thought. Dwarden, a thread about galaxies already exists. Salvo, there is already a galaxy thread here.